Create a captivating view with minimal visual disruptions with the HP Z22n Narrow Bezel IPS Display. Nearly borderless on three sides, it also includes factory color calibration for consistent color between projects and displays and flexible device connectivity. Enable virtually seamless views from almost anywhere in the room with a display that’s almost borderless on three sides and has 178-degree viewing angle IPS technology. Color accuracy the first time and every time. Maintain visual integrity across all of your displays with a 95% sRGB color gamut that is calibrated at the factory. Zero bright sub-pixel defects, guaranteed. Don’t just take our word for it. We back the display up with a three-year limited warranty, optional HP Care Pack, and an HP Pixel Defect Policy that will replace the screen if even one bright sub-pixel fails. Keep your PC and device connections close by with integrated HDMI, VGA, DisplayPort, and two USB ports. Work comfortably with adjustable tilt, height adjustment, and swivel settings. Use pivot rotation to customize portrait or landscape views when using multiple displays. An integrated HP Quick Release Bracket supports wall mounting. Make the most of your available space by attaching your HP Desktop Mini, HP Chromebox, or select HP Thin Client directly behind the display. Keep things tidy with an integrated power supply and cable management features. 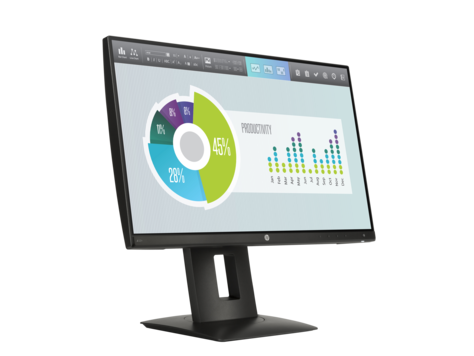 Design the screen for how you work, adjust brightness on multiple displays, define and distribute custom settings with an executable file, and deter theft with HP Display Assistant software. Protected by HP, including a 3-year standard limited warranty. Optional Care Pack Services are extended service contracts which go beyond your standard warranties.